If your current kitchen and bathroom cabinetry seems a little behind the times, allow Reborn Remodeling Solutions to give it some new life. Whether you’re looking for a timeless, traditional kitchen or a sleeker and more modern one, the cabinetry experts at Team Reborn can help to transform your kitchen or any other room in the house, and give you the look you’ve longed for. We first opened our doors for business back in 1983, and since day one, we have been family-owned and -operated. This means we take our work personally and treat each bathroom design and kitchen remodeling project as if it were our own. Once your cabinetry project is underway, you will be working with Team Reborn, and you will always know the status of your project. And, before any of our employees ever venture to your home for scheduled work, you will first receive a friendly reminder phone call from us. It is these kinds of measures we take that has made us a favorite cabinetry and remodeling company throughout Southern California. 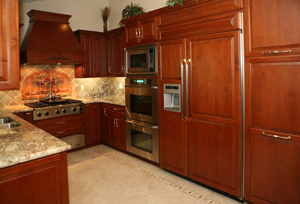 If you would like to find out more about the custom cabinetry and cabinet refacing services from Reborn Remodeling Solutions, please give us a call at 1-877-371-4943 or send us an e-mail today. If you’d prefer to see us in person, though, feel free to stop by our state-of-the-art 40,000-square-foot cabinetry manufacturing facility and showroom in Anaheim any day of the week, or we’ll be happy to come to your home and bring the showroom to you. That’s right, we’re open for business seven days a week, and we proudly serve customers in Brea, Orange County, Mission Viejo, Huntington Beach, Fountain Valley, Yorba Linda, Laguna Niguel, Placentia, Santa Ana, and all throughout Southern California. "This is our second project with Reborn and we are just as happy as we were with the kitchen cabinet re-surfacing project."